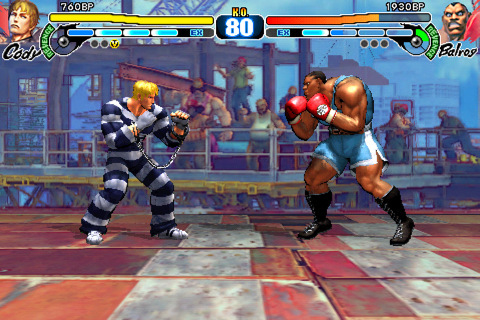 I was really excited when Capcom announced at E3 this year that their wildly successful Street Fighter IV [$4.99] for iPhone would be getting a follow up title called Street Fighter IV Volt [99¢]. I’ve been a huge Street Fighter fan for the majority of my life, and the original iPhone version is easily my favorite fighter in the App Store. It was a pretty big deal when it first released back in March of last year, not only because it was such a huge IP but also because it proved that a traditional fighting game could be done well with virtual controls. Capcom fed a steady stream of updates to Street Fighter IV over the past year which have added new characters and features to the game, keeping it on top of the iOS fighting heap. Now with Street Fighter IV Volt, Capcom has extended the long standing Street Fighter tradition of releasing an incremental update as a new game. What you’re getting with Volt is essentially everything that was already in the first Street Fighter IV, right down to mostly identical graphics and sounds, plus a few additional features and 3 new characters – Cody, Balrog and Vega. These minor enhancements are nice, but the big selling point of Volt is the inclusion of online competitive multiplayer over WiFi, which was easily the most requested feature of the first game. By default you are set up to accept any online challenges that might be out there. This means that if you’re running through the arcade mode you might suddenly get interrupted with a challenge from a random player online who’s searching for a match. This ensures that there should always be a pretty large pool of players to match up with when you feel like throwing down online, and it also gives it that old-school arcade feeling of having a complete stranger walk up to your arcade cabinet unexpectedly and issue a challenge. Of course, it would be hard to even make it through arcade mode with constantly being interrupted with matches, so thankfully you can easily switch the auto-acceptance on and off at will. 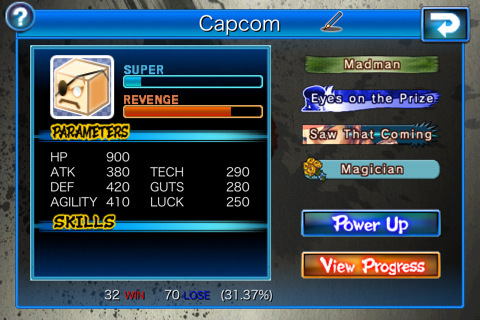 As for the actual experience of competing online in Street Fighter IV Volt, so far it leaves a lot to be desired. Random matches are easy enough to find even in this early stage of the game’s release, but they are usually plagued with lag and are prone to randomly disconnecting. Sometimes the online works near flawlessly, and when it does it’s absolutely brilliant. But more often than not you’ll be subjected to jittery animations and momentary freezes that can really disrupt the flow of a game. Even with the lag matches can still end up being a ton of fun, but it’s hard realistically gauge either players’ actual skill level when playing under those conditions. I’m hoping things will smooth out as more players pick up the game and jump online, but currently it’s hard to consider it anything more than just a novelty rather than a serious competitive online experience. One pretty interesting new aspect to Street Fighter IV Volt is something called Wandering Warrior. This mode has you creating an avatar for your multiplayer profile which can be leveled up and upgraded in an almost RPG-like fashion. Then, while you’re facing an opponent in an online or local multiplayer match, your avatar will square up against your opponent’s avatar and they’ll duke it out as well. Special points are earned during multiplayer matches which can be put towards upgrading your avatar and unlocking new icons and badges which grant new abilities and enhancements. It’s a pretty cool little meta game that’s a fun side distraction to throwing down against people in multiplayer. Despite its spotty online performance and content that is heavily recycled from the first game, Street Fighter IV Volt improves on what was already a successful formula and is the definitive version to own on the App Store. If you aren’t very interested in its online multiplayer or the 3 new characters, then you may be fine just skipping Volt and sticking with the original for getting your quick Street Fighter fixes on the go. The one wrinkle to this advice is the fact that Capcom is currently running an introductory sale for Street Fighter IV Volt. It launched for just 99¢, and the price will increase by a dollar each day for the next several days before hitting its regular price of $6.99. Even if you already own the first game and the new features don’t totally interest you, I’d still suggest picking up Volt if you can snag for just a dollar or two. It may be a bit harder to justify the upgrade when it hits full price, however. Street Fighter IV Volt is mostly just more of the same, but that’s not such a bad thing since the original release was so good. The highly anticipated online multiplayer isn’t quite up to par technically, but it can still provide some pretty entertaining moments. Hopefully the online performance can be improved over time, as there is plenty of potential for one of the best multiplayer experiences on the App Store.